One day to go and a flatter stage but with just two seconds between Chris Froome and Alberto Contador the stage is set for regicide rather than coronation. Contador can try but it’s hard to imagine him surprising Team Sky. Don’t miss the earlier finish time if you’re planning to watch on TV. Stage 4 Wrap: Was it deliberate? Peter Kennaugh of Sky went clear instead of riding tempo. As soon as he was reeled in, team mate Mikel Nieve went away solo. Then Froome attacked, passing Nieve. Certainly this wasn’t the timetable we expected from the Sky train but the new schedule worked a treat and caught Alberto Contador. There were other differences too, perhaps it was the slope but this wasn’t the “washing machine” Froome of Mont Ventoux in 2013, legs whirring on a spin cycle. There was a forcefulness to the pedal stroke. Meanwhile Contador was visibly slower and losing time. We’ve got used to him being in command in the mountains but this time he was chasing alone. His pedal style became choppy and at times his head tilted to one side. Ahead Froome kept going, the familiar flurry of limbs and he crossed the line resembling a cyclo-cross rider, the dirt road underneath leaving its mark on his kit and bike. As much as the race has been reduced to a duel between to protagonists, consider the agony of the others. Two seconds separate Froome and Contador… then 2m32 later comes Benats Inxausti, the best of the rest and with the kind of delay possible by the final stage of a grand tour rather than after two mountain stages. Meanwhile breakaway survivor Mirko Selvaggi was caught with 900m to go… and finished 4.56 down on Froome. Stage 5 Preview: no major climbs give this the feel of a sprint finish. 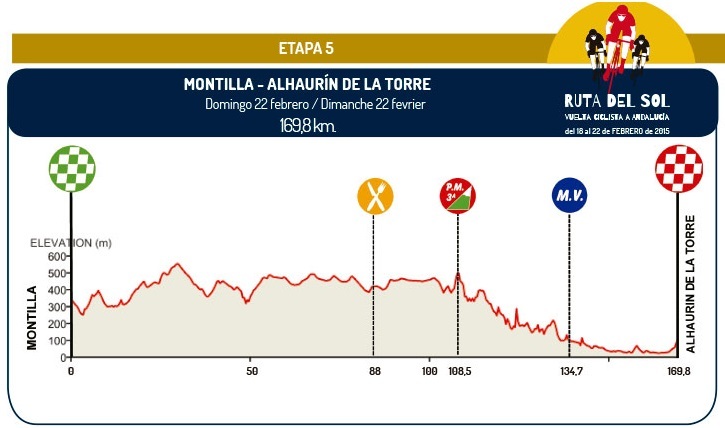 If a breakaway goes and there’s nobody from Movistar or Giant-Alpecin then these two teams will toil to chase the move down in the hope of setting up J-J Lobato and John Degenkolb respectively. CCC might join in too although they’re likely to send someone up the road. That little rise at the end of the stage? It doesn’t seem to be there. The road rises into Alhaurin (“the Garden of Allah”, as named by the Moors) with what looks like a 4-5% rise, then levels off, then another similar rise again. This slight climb again suits Lobato and Degenkolb. I’ve put Lobato first for the ease with which he won the other day but given yesterday’s reversal on the GC perhaps “Dege” sticks it to Lobato? Will Contador try something? You’d expect it but it’s so obvious and hard to see him sprinting away for the stage win and distancing Chris Froome. But this short race has been long on drama already. Weather: sunny and 17°C with a 20-25km/h tailwind to the finish. TV: live on Eurosport with the finish forecast for around 3.00pm but it could be earlier with that tailwind. For more viewing options, as ever cyclingfans.com and steephill.tv have links to live feeds. Fascinating turnaround from previous day. Neither of them may be in top form yet, but it look alike they both want the psychological advantage of taking first blood. The greater surprise is Froome doing so well on 15-20% gradients – it look alike he might have been putting in some series gym work over the winter, presumably with an eye on fighting the climbers in the TdF. If the successive individual attacks from Sky were planned, that’s clever, but odd to show off this as a tactic in an early season event. I suspect they were all freed to have a go when it got steep, but Froomie was strongest, and some. Awesome couple of days racing, as good as any! deliberate or not by sky, at least it’s making for and interesting race. I know it’s not just a two horse race, but this could be an interesting season. What a great start to the European stage races this Ruta del Sol has been! And neither rider yet close to his best. Is it remiss of me to want this race to go on forever? I guess we will just have to wait for Tirreno for these hostilities to resume. One only hopes that Froomey doesn’t let those 2 seconds slip with some lack of awareness tomorrow. Sky are not always that bright tactically. What a fantastic two days, and it’s still February! Can’t wait for the classics, but it’s a shame we have to wait til July for the two big guns to duel in earnest. They will duel in every race up until then. It should be a fun spring ! Selvaggi was caught much earlier on the climb. The captions must have been wrong. He was caught at the 1k banner, although the tv gps was showing 900 meters. Thanks. The graphics did seem to be off but it’s still some collapse, understandable given he was trying to hang on for as long as possible and once caught it was game over. A superb one-week stage so far. Goes to show the value if this currently underrated kind of race. It only takes 2 guys like that, with real blood in their veins. ….and hopefully it’s all their own blood! Seeing people have bad days is always encouraging. But did he have a bad day? He was 20 seconds ahead of 3rd and took huge time on the rest of the field. He didn’t struggle across the stage, just got dropped like a stone by one other rider in the final km. That’s not a bad day to me, it’s an exceptional day for Froome. I don’t want to start with the innuendo but you definitely can’t hold that today up as evidence of credible change. I don’t want to start with the innuendo … but I will anyway. You could never hold any single performance up as evidence of anything. Doping is not demonstrated or refuted by single performances. Anonymous, if you’re this cynical, why bother coming here to leave comments like these? It’s just trolling. Troll off, please. Couldn’t help thinking Nieve may have had that in the bag, except Froome had bigger plans. One of these days Peter Kenaugh is gonna keep going and win a stage, the fella is to good to be doing a job for Froome. Be better off somewhere else for my money. At least his bike looks good this season, rather than the black garden gates of his team. What makes you think Kennaugh is “too good”? Is he any better than Geraint Thomas, Kiriyenka, Porte, Nico Roche, Nieve or Suitsou? For my money he is just one of several very good riders that go into making a winning team – something the top riders still need to win races. The Sky team selection for this race has been stellar in my opinion. Add Thomas, Porte and Eisel (losing Zandio) and thats the TdF team right there. I found this stage entertaining after the desert borefests of late. 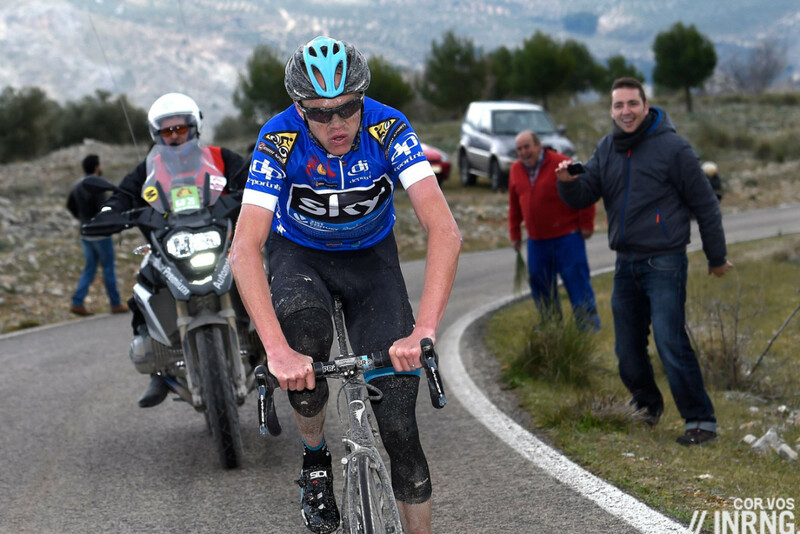 Froome 2015 looks like he’s trying to tear the bar/stem off the bike rather than a guy pushing a shopping cart with a cell phone cradled on his shoulder. I suspect Il Pistolero is very content, figuring if Froome is in this condition in February he’ll have a tough time come July. Same with Nibali. I think those ringing alarm bells at this point in the season are getting way ahead of themselves. Wonder if anyone down at the Tour of Insane Heat and Sandstorms is wishing they could be enduring the “awful” weather in Europe at this time of year? I’d love to hear details on all the equipment failures reported yesterday…WTF? Froome looking good already. He seems to be a more determined rider. Perhaps angrier. When push comes to shove on the mountains come July, my money’s on Froome. Anyone in Australia trying to follow this race on Foxtel? It’s a joke. The Eurosport coverage keeps ending with a few km’s to go. Happened again on stage 4. What’s the point in watching! If we suppose the Sky tactic was deliberate, what could have been the rationale behind it? Pace disruption? Wearing out Tinkoff helpers(not like they’d pursue them)? What if AC jumped with one of them? very off topic but, the image reminded me. chris froome wears a lot of different brands of shoes. anone know why.